In a fresh and exciting way, this new book shows how tolerance connects with the practice of philosophy. Andrew Fiala examines the virtue of tolerance as it appears in several historical contexts: Socratic philosophy, Stoic philosophy, Pragmatism, and Existentialism. The lesson derived is that tolerance is a virtue for what Fiala calls 'tragic communities'. Such communities are developed when we come together across our differences, but they lack the robust sense of connection that we often seek with others - the complete sort of happiness that is offered by a more utopian ideal of community. But rather than viewing this conclusion as a failure, Fiala maintains that tragic communities are the best communities possible for human beings who are aware of their own individuality and finitude. Indeed, they are typical of the sorts of communities created by philosophers engaged in dialogue with others. - Publisher In this fresh and exciting work, Fiala shows how tolerance connects with philosophy. He examines tolerance in Socratic philosophy, Stoic philosophy, pragmatism and existentialism, and concludes that tolerance is a virtue for what he calls `tragic communities'. Such communities develop when we come together despite differences, but they lack the robust sense of connection we may seek - the complete happiness offered by a more Utopian ideal. Rather than viewing this as a failure, however, Fiala contests that tragic communities are best for humans who are aware of their own individuality and finitude. Indeed, they are typical of the sorts of communities created by philosophers engaged in dialogue with others. Tolerance and the Ethical Life will appeal strongly to specialists and upper-level students of ethics and political philosophy, both for its unprecedented historical exploration of tolerance, and its application to contemporary moral theory. About "Tolerance and the Ethical Life"
In this fresh and exciting work, Fiala shows how tolerance connects with philosophy. He examines tolerance in Socratic philosophy, Stoic philosophy, pragmatism and existentialism, and concludes that tolerance is a virtue for what he calls `tragic communities'. Such communities develop when we come together despite differences, but they lack the robust sense of connection we may seek - the complete happiness offered by a more Utopian ideal. Rather than viewing this as a failure, however, Fiala contests that tragic communities are best for humans who are aware of their own individuality and finitude. Indeed, they are typical of the sorts of communities created by philosophers engaged in dialogue with others. 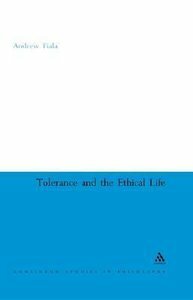 Tolerance and the Ethical Life will appeal strongly to specialists and upper-level students of ethics and political philosophy, both for its unprecedented historical exploration of tolerance, and its application to contemporary moral theory.